1000 followers INTERNATIONAL giveaway! Your choice of ANY Urban Decay Eyeshadow Palette! Well hello there! Just in case you wasn't already aware, I hit 1000 followers over on Bloglovin last weekend! I hadn't been active online for a few days so wasn't aware I'd hit it until two days later! Well I now have over 1100 followers now and that's just phenomenal! I'm not quite sure how or why my little blog has grown so quickly in five months.... yes I do! It's cos of you fantastic and beautiful people! I always said I'd hold a giveaway once I reached 1000 followers, but I didn't expect it to be just yet! So as promised here is my giveaway... that just so happens to be an INTERNATIONAL giveaway too! Yes you heard correctly! Press the read more on how to enter! So what is the prize? Are you reading the picture correctly? Yes you are! 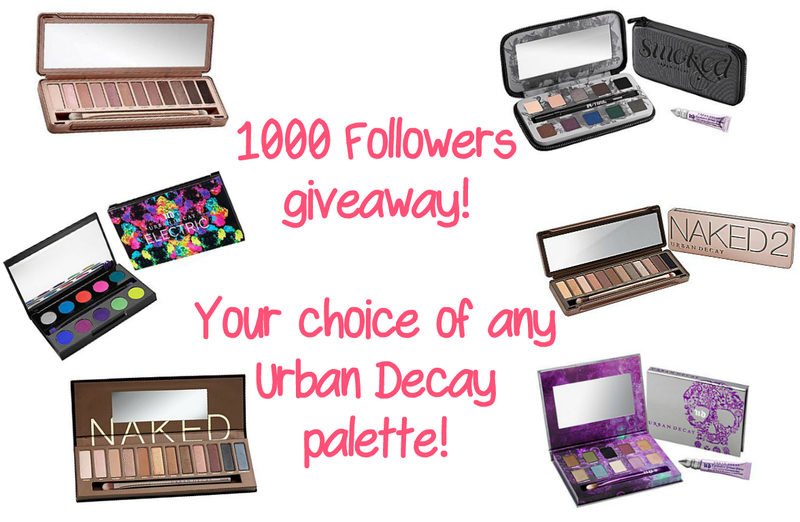 The prize is your choice of any of the above Urban Decay Eyeshadow Palettes! I personally adore Urban Decay makeup, especially their eyeshadows and think every woman/girl should have at least one of their palettes in their collection. So out of my own money (this isn't a sponsored giveaway) I shall be sending the winner whatever one of these palettes they want! And as I stated above this is also open to any of you international readers out there! There are terms and conditions that I have set up and also that are set by law so make sure you give the below section a good read before entering. This is open to international countries. There are two mandatory options for you to enter, which are to follow me on Bloglovin and on Twitter. Both options are mandatory which will give you a total of 20 entries for the chance to win. There are also optional chances to enter to give you more chances to win! If you are under 18 please obtain your parent or guardians permission. The winner will be picked by random via the Rafflecopter within 72 hours of the giveaway ending. The winner will then be notified via DM on twitter within 72 hours of being picked, and then announced on twitter at the same time. Prizes will be sent via royal mail, special delivery within 14 days of contact from the winner. By not completing both mandatory options you hereby void all other entries and will be disqualified. Thank you so much to everyone who has followed me and who comes to visit JustJulie!